What is it with Mattel and distribution? Series 1 of (the ridiculously named) DC Universe Classics showed up everywhere pretty reliably, but now we're left twiddling our thumbs waiting for Series 2 to show up anywhere other than a few scattered hotspots. And this is nothing new from the company that ruined the Masters of the Universe relaunch: the first few series of DC Superheroes were plentiful, then things bogged down with Superman repaints in the middle; by the time we got back to Batman, the line was impossible to find, leaving the interesting characters in the last few series infuriatingly out of reach for most collectors. Permanently altered by an experimental chemical force-fed to him by mobsters, once handsome movie star Matt Hagen now revenges himself on the world as the shape-shifting monster Clayface. He can regain the illusion of his lost humanity for a time, but it's only skin-deep. His inner self is now as ugly and distorted as his exterior, and it eventually comes though in whatever form he wears. Clayface is, like Mr. Freeze, one of the villains who was vastly re-imagined for Batman: The Animated Series. The Clayface in the comics at the time was a guy with an acidic touch who wore a containment suit to hold himself together, not a walking pile of mud. That version was entirely invented for the cartoon, but the comics wasted no time in copying the look. 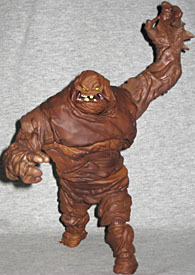 Of course, their version isn't Matt Hagen [it's the original Clayface, Basil Karlo --ed.] but when the character looks like this, does it really matter who he used to be? The Four Horsemen's sculpt of this monster is wonderfully goopy. His body is covered in layers and layers of drooping, dripping brown clay-flesh that piles and spills over itself. The design is symmetrical only in the broadest sense: his arms are different sizes, he carries his shoulders differently, the blobs clay are falling at their own rates, and his feet are different - one is just a pile of muck, the other has the sad remnants of his toes poking out the front. While the fat-fingered right hand and arm are nearly a normal size, the left arm is larger all around and even has a few rough spikes jutting out: either Clayface is shape-shifting, or he's picked up some large quartz crystals along the way. The head is definitely influenced by the animated version, but the Horsemen have turned things up, tweaking it slightly. Clayface still has the bright yellow eyes, but his mouth is just a misshapen gash with a few random teeth poking out at odd angles. His chin seems to flow into his chest, and a tendril of clay hangs from his "cheek" to connect with his lower jaw. It really does look quite gross, but also entirely appropriate for the character. 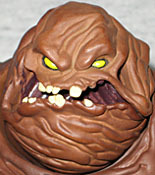 Clayface stands an even 7" tall, and is painted with various shades of brown and yellowish tan. His teeth and his toe nail (yes, there's just one) are a faded yellow, and his eyes are outlined with black. The interior of his mouth is a bit more purple than the rest of his body, which sets it off nicely. He's darker than the BtAS model, but the connections between the two are still clear. There's a different texture on his right arm than his left, as well. 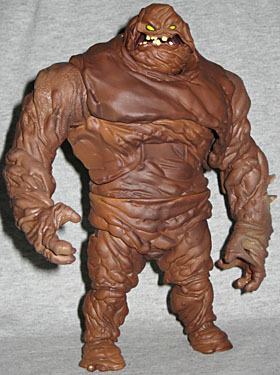 The articulation is rather strange: while the back of the package shows Clayface with the usual hinge-jointed elbows, swivel wrists and balljointed shoulders, the final product has rubbery arms with a bendy wire inside. It works fine, but why did Mattel go that route? Not even the Four Horsemen can say: as far as they knew, the figure was going to have normal articulation, so they were just as surprised as any of us. Now he just has plain swivel shoulders. Of course, those are paired with a balljointed head, hinged torso, swivel waist, balljointed hips, balljointed knees and balljointed ankles, so there's plenty of motion there. The waist tends to stick, because there's a rubbery "skirt" of clay there, but yes, it absolutely does turn. Just give it some torque. Considering all the balljoints and the freely poseable arms, you can get some really threatening poses out of Clayface. He doesn't include any accessories, since A) he doesn't use any anyway, and 2) he pretty much fills the blister as it is. There's an orange skyline backdrop behind him, if you like that sort of thing. As far as Batman villains go, the animated Clayface is pretty unique. It wasn't his motive - revenge - that made him stand out, but his lack of depth. Mr. Freeze wanted revenge, but he wanted it for his wife. Two-Face was disfigured, but his story was more about the mind than the flesh. 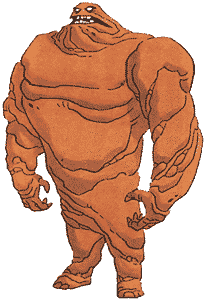 With Clayface, however, the only driving issue was his own shallow, self-centered nature: he was a movie star, used to getting whatever he wanted, and suddenly that was taken away from him; the only thing Matt Hagen lost was Matt Hagen, so his anger is all about childish greed.